This remarkable stone meteorite was found by Sidi Hamada in the vicinity of Enafor Oil Rig # 40, in Béchar Province, Algeria, in October 2016. The pentagon-shaped mass shows a convex breast side, and a rather flat trailing section. In cross section, the meteorite has an airfoil profile. The trailing surface is shaped by two planar fractures that show only minor traces of atmospheric ablation (S1, S2). This remarkable stone meteorite was found by Sidi Hamada in the vicinity of Enafor Oil Rig # 40, in Béchar Province, Algeria, in October 2016. 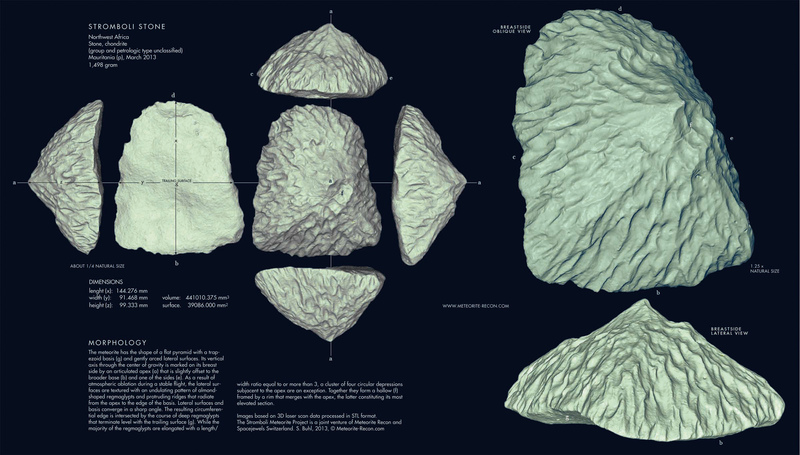 The pentagon-shaped mass shows a convex breast side, and a rather flat trailing section. In cross section, the meteorite has an airfoil profile. The trailing surface is shaped by two planar fractures that show only minor traces of atmospheric ablation (S1, S2). Fluted regmaglypts in radial array are framing the breast side like a crown of flame. Their apparent point of origin is located slightly outward the post-fall edge of the mass (a), where the meteorite has the least diameter. This, however, would indicate a flight orientation with the center of gravity trailing instead of leading – an orientation which is highly unprobable and unlikely to result in aerodynamic stability. Since surface texture and atmospheric sculpting of the mass are controlled by a stable and lasting orientation of the meteorite during its ablative flight, a flight orientation with the center of gravity in the lead has to be assumed. Thus, the regmaglypts and ablation furrows at the N-surface’ B-edge must be understood as directed rimwards towards “a”, rather than conversely. While still in its orientation, the mass fragmented at least twice shortly before transition into cold flight, which is indicated by slightly overformed edges along the seam of N- and E-surface (b, c). The artwork presented here, is based on 3D laser scan data captured by structured light projection lase scanning. Data points are shown as point cloud in xyz-table. Scan resolution is 0.25 mm. Bordj Badji Mokhtar is an unclassified iron from the Algeria – Mali border area. The compact yet heavily sculpted piece weighs 11.2 kg, with well preserved fusion crust on large parts of the surface and only minor surface oxidation. Large regmaglypts and heavy ablation of edges and protruding ridges bear witness to its fiery descent through Earth’s atmosphere. The irregular shape of the iron and the disntinct regmaglypts indicate a chaotic spin of the meteoroid during its ablative flight. Since the resulting surface shows no traces of the initial fracture planes that separated the meteoroid from its larger mother body, we can assume that the mass separated early in flight and continued the atmospheric passage as an individual without further fragmentation. The excellent degree of preservation of the meteorite, particularly on the S-surface, allows to observe the thin, magnetite-rich layers of fusion crust and solidified flow lines. Due to the matte olive-drab patina that has developed on the outer magnetite layer, we can assume that the S-surface represents the surface exposed in situ, while the N-surface appears to have been the contacting surface. The iron meteorite was found by nomadic Berbers in 2001 and “probed” for a possible gold or silver content with negative results, then left at a camp site, remebered as a mere curiosity. 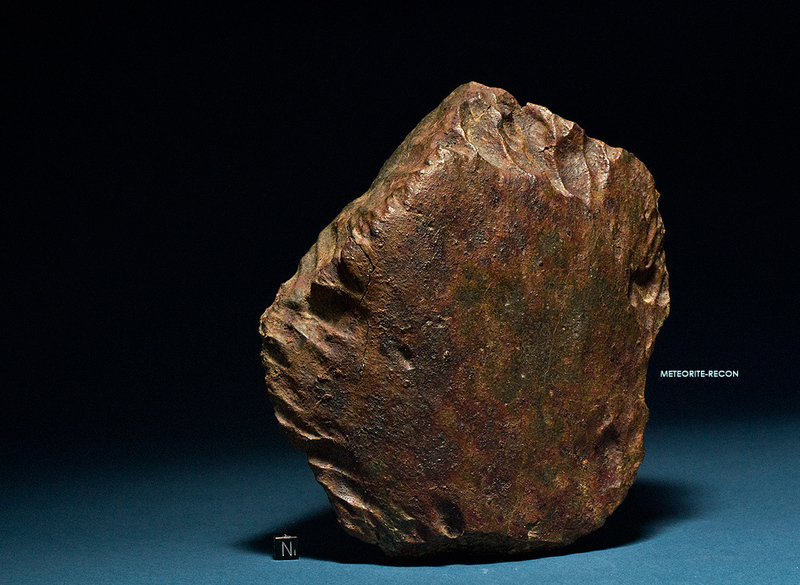 Only 2015, when the finders made contact with Moroccan meteorite dealers, the iron was revisited, recognized as an iron meteorite, and recovered from its find location. Clampmarks (a) and a small corner chisseled from the mass (b), are evidence of the crude analytical approach of the local finders. Although no chemical and structural analysis has been conducted, the visible shear faults (b) indicate that the meteorite structurally is an octahedrite, most probably with a medium bandwith (Om), which would place its Ni content between 7.4-10.3 %. The artwork presented here, is based on 3D laserscan data captured by structured light projection. Datapoints are shown as polygon mesh (see detail below) and point clouds in xyz-table. N-surface shows point cloud merged with 2-D photographic data. Scan resolution is 0.25 mm. 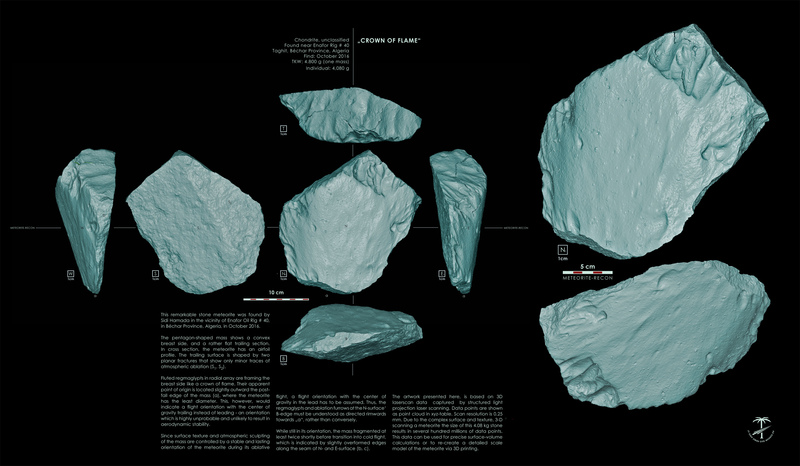 Due to the complex surface and texture, 3-D scanning a meteorite the size of this 11 kg iron results in several hundred millions of data points. 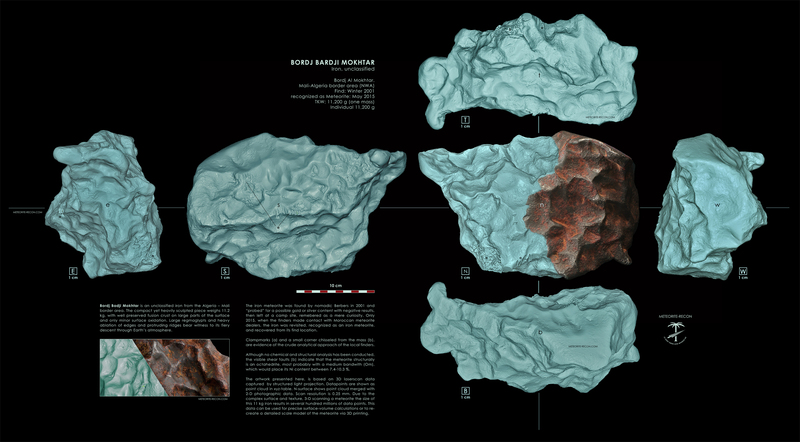 This data can be used for precise surface-volume calculations or to re-create a detailed scale model of the meteorite via 3D printing.